Lithograph printed in two colors from stone, a fine, fresh impression of the only known state, the full sheet, printed on white Roll Rives paper, with margins, hand-signed, dated and numbered in pencil by the artists, executed in an edition of 50 (there were also 10 AP, a BAT, 2 PP and 2 Cirrus Proofs), printed by Chris Cordes at Cirrus Editions, published by Cirrus Editions, Los Angeles, in very fine condition, framed. Cordes, Chris, ed. with Debbie Taylor and John Yau. 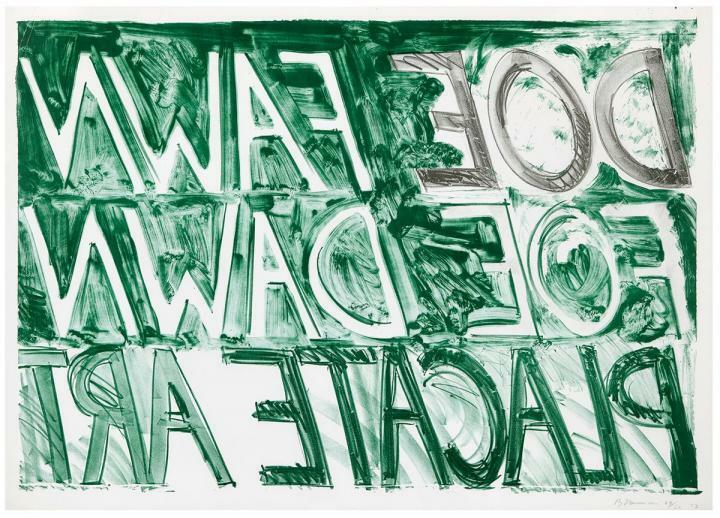 Bruce Nauman Prints 1970-89. New York, Castelli Graphics with Lorence-Monk Gallery, New York and Donaldy Young Gallery, Chicago, p.118, no.20, illustrated in black and white (presumably another example), also plate 20, illustrated (presumably another example).